Adieu: für Wolfgang Sebastian Meyer, Nr. 21. Wien: Universal Edition, 1969. Wraps. Very Good. Quarto. Universal Edition Nr. 14877. For Flute, Oboe, Clarinet, Horn, and Bassoon. Instructions in German and English. One score of 9 leaves. Some wear and bumping to extremities, else very good. 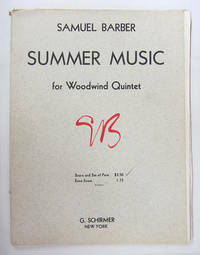 Summer Music for woodwind quintet. New York, N.Y.: G. Schirmer, 1957. Wraps. Very Good. Quarto. Score (22 pp.) and five parts. For flute, oboe, clarinet, horn, and bassoon. Previous owner's signature on score and parts, else fine. 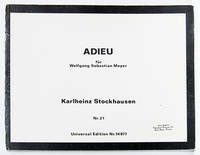 "This work was commissioned by the Chamber Music Society of Detroit, Karl Haas, President. 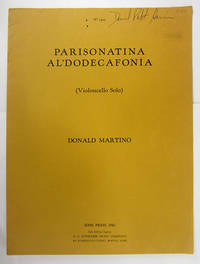 It was first performed on March 20, 1956 at the Detroit Institute of Arts by James Pellerite, flute; Arno Mariotti, oboe; Albert Luconi, clarinet; Charles Sirard, bassoon and Ray Alonge, French horn." 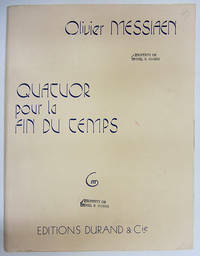 contra mortem et tempus for flute, clarinet, violin and piano. Bryn Mawr, Pa.: Theodore Presser Company, 1967. Wraps. Very Good. Folio. 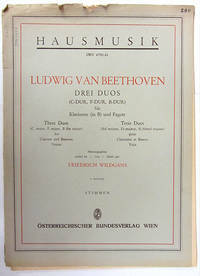 Four performance scores (4 x 39 pp.). Previous owner's stamp. Used for performance. All parts with some useful and informative annotations. Red paper wraps, stapled. Oblong Folio First edition. Plate number 114-40116.